Mr. MacPherson has been prominent in the legal life of Saskatchewan as the senior partner in the firm of MacPerson, Leslie and Tyerman, Regina. He is a 1913 graduate of Dalhousie University. He is chairman of the Royal Commission on Transportation. 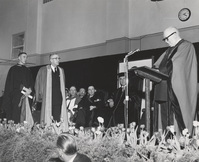 He has been counsel for the provincial government in the Turgeon Royal Commission inquiry into the railways and other forms of transport in 1950. He is a former Attorney General and Provincial Treasurer of Saskatchewan, serving in the Anderson government from 1929-1934. He has continued to be prominent in the affairs of the Progressive Conservative Party. In 1938 adn 1942, he was a candidate for the party leadership. Mr. MacPherson is a director of many companies.